Description : The modern Reebok boxing mitts with generous padding protect your hands when performing pad work and general boxing training. Easy to slip on and off, the mitts feature elasticated wrist support and a ventilated palm to keep you cool throughout your workout. 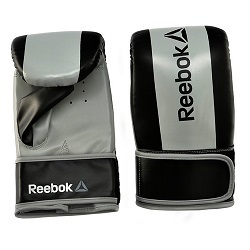 Perfect for both beginners and advanced boxers, these Reebok mitts withstand tough workouts and regular use. Mitt training promotes proper punching and striking skills, and these gloves are a stylish yet practical option to help you develop a wide variety of combative skills - plus you can take them anywhere for a spontaneous sparring session. (Inc. GST) Qty Add to Cart?